You are currently browsing the archives for the tag 'limited edition fragrances'. What could be more British than London rain? This fact inspired Master Perfumer Christine Nagel to capture the different moods of a downpour, from the soft sparkle of a morning shower to a wild rainstorm at night for Jo Malone‘s upcoming limited edition LONDON RAIN collection. 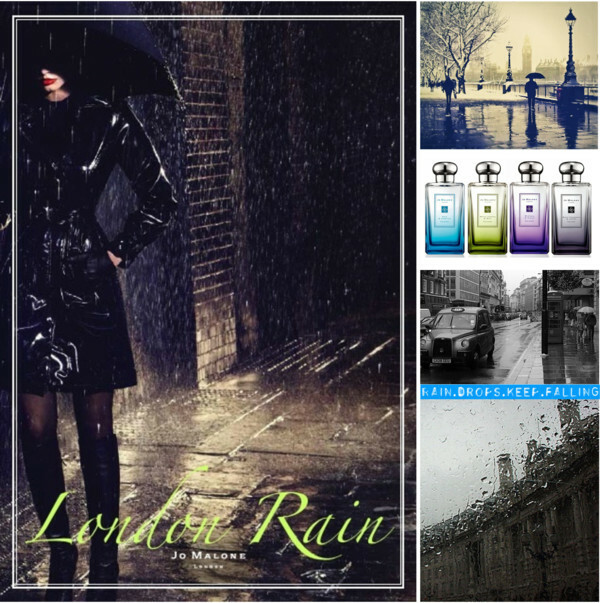 “The initial concept from Jo Malone London was to create a scented portrait of London to conjure up the romantic and deeply intense rainy days,” says Nagel. I find the weather inspiration such a great concept and I cannot wait to indulge my nose in those four new scents. Glassy beads of dew, awakening a London park at dawn. A revitalising scent, enlivened with herbaceous angelica and juicy lime on an earthy base of vetiver. Aqueous and clear. A soft morning shower, soaking purple wisteria cascading over London stone walls. Infused with the wet-petal scent of violets and water lily. Rainwashed and intoxicating. An afternoon cloudburst, drenching gardens exuberant with jasmine, lily, orange flower and rose. Eccentric with its dash of scrambling wild mint. Enchanting and refreshing. Midnight rain. Seductive with the carnal touch of cumin, chilli leaves, and aromatic juniper. Dark with cedar wood. Humid with moss. Modern and urban. In the UK and other countries available from March 2014. Each Cologne 100ml RRP £82 / €100. In Switzerland available in the beginning of May 2014. Each Cologne 100ml RRP CHF 130. Thierry Mugler’s limited summer edition fragrances 2011 arrive on the market, providing us with a trio of extravaganza Angel Sunessence, Alien Sunessence and for men A*Men Pure Havane. At a first glance, the whole concept promises and tempts with the outstanding designs of the flacons, just like the essences they conceal inside. Angel Sunessence Ocean d’Argent is a limited edition that mimics the grandiosity of an azure blue sea combined with hot and glamorous summer sun rays with its intense, signature gourmand aromas of the famous original Angel perfume from Thierry Mugler. Angel Sunessence Ocean d’Argent, or “Silver Ocean”, is a summery fragrance that represents an enchanting meeting between the starry sky and the azure ocean. It opens with fresh notes of kumquat citrus fruit, with sea salt blossom tones in the heart and the base of patchouli and vanilla. The fragrance will be available in Switzerland from mid May 2011, as 60 ml EDT Légère, in a limited edition for CHF 85. – A new version of the now legendary Alien, the fragrant tale of floral notes, amber and fresh solar accords. The top notes of Alien Sunessence Limited Edition 2011 Or d’Ambre offer bright and fresh vitamin flavors of kiwi and tonic, a refreshing cocktail that invigorates and stimulates the senses just like the energy of the sun. The heart of the fragrance is exotic and overwhelming. The wealth of the heart disarms by its feminine and sensual scents of vanilla and Stanhopeaa orchid flowers. The blend of these notes evokes the sunset delights of an exotic garden. The base notes provide a fascinating wealth of amber and woody accords, leaving a gentle trail of fortune, just like a warm touch of sunshine. The new bottle is a true solar gem. The iridescent flacon shines and glitters in a spectrum of colors from gold and orange to bright pink with a shiny, pearly glow. The additional effects on the bottle evoke the amber syrup, which refines this fragrance, making it even more beautiful and rich. After two limited edition versions of the original A*Men fragrance, A*Men Pure Coffee from 2008 and A*Men Pure Malt from 2009, Thierry Mugler presents the new edition A*Men Pure Havana in May 2011, a gourmand interpretation of the tobacco scent and the finest Cuban cigars. The composition opens with fresh tobacco leaves and honey, followed by notes of patchouli, vanilla and bitter cocoa. The base is warm and oriental with notes with labdanum, amber and styrax. The fragrance will be available in Switzerland from mid May 2011, as 100 ml EDT, in a limited edition for CHF 105. If you like the outfits, you can start shopping by clicking on the tiny pictures.